Twice this fall, Shef's been dancing along in front of me not really paying attention to where he's going, and I've tripped over him while holding Mac. I've found that when you trip while holding a baby, you have a greater chance of falling all the way to the ground because you won't let go of the baby to break the fall. Rather, you try to roll to the side while protecting the baby's head with your free hand. Also, you instinctively try to hold your chin up to avoid slamming it on the ground. The results are sort of humiliating. Both times it's happened to me, I've been completely prone with the baby in my left arm. Once, his head flopped at the last second and hit the street. He wasn't hurt, but we were both pretty freaked. These falls cause a lot of soreness. My entire right side is aching today because of the spill yesterday in the fanciest mall in the Twin Cities. Dan was there, and he stared at me sprawled out on the floor for a few seconds before jumping in to help. I think it took him a little while to figure out how I'd gotten all the way down there, with my belly touching the ground. In other news, Shef has a new podacast! 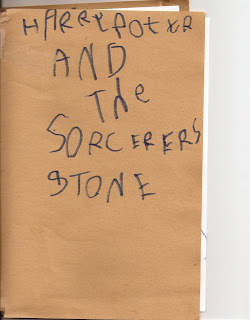 It's a Harry Potter podcast, and in it he reads from his retelling of Harry Potter and the Sorcerer's Stone. It's about three minutes long. You can click here to hear it. Fantastic podcast, Shef! I'll share it with some kiddos here at my school! I do believe that Shef's podcasts could put some of my tenth graders' work to shame. Nice work, all around, though I enjoyed the British accent the best.